James Donnelly is a Spoken Word artist & electronic musician, and an existential wordsmith with plenty to say. He has released one book of poetry ‘Enlightenmental Disorder’ and is releasing his second ‘Archetypical’ on March the 9th with a companion album of spoken word-electronica. 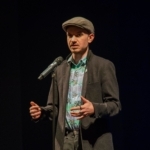 He has performed and written as a freelance poet for nearly 2 years and has helped organise events in Lincoln.